Quick1FR makes CFTC Rule 1.55 reporting easy. By using the same data provided by the FCM to the CFTC daily to produce online reports on the FCMs website, upload documents, provide complete tracking for compliance purposes, email alerts to prevent failure to comply with the rule, and the ability to create compliance and financial reports for management. Easily fulfills the CFTC rule 1FR requirement (specifically CFTC rule 1.55(0)(1) of publically posting the required financial information and notices to your website by using an export of the data already being entered daily into CFTC’s WinJammer. Support for uploading additional required documentation including annual reports, unaudited-monthly financials, and any supplemental documentation. Displays required notices including links to the NFA Basic website and CFTC for additional financial information, and any other information you would like to display including contact information, financial, and legal notices. Quick1FR creates a log of when, where, what and who updated the data on the website so you have a full record of compliance with the requirement. Make sure you stay compliant. Quick1FR will send an email reminder if the data has not been filed by a certain time of day. Quick1FR stores all of the data from the WinJammer reports about your FCM and turns it into a powerful reporting tool. What is our seg fund growth overtime? What is the size of our access holdings this month? On average? 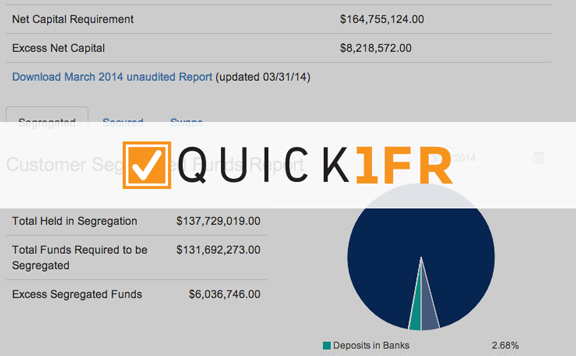 Quick1FR provides a running report on the funds held to show holdings overtime for internal reporting. We appreciate the partnership we have with all of our clients and in particular four FCMs with whom had input in the development of Quick1FR, along with guidance from Marc Nagel, former Chief Compliance Officer of FCM Dorman Trading and now a compliance and futures industry consultant. Learn more about Quick 1FR today!